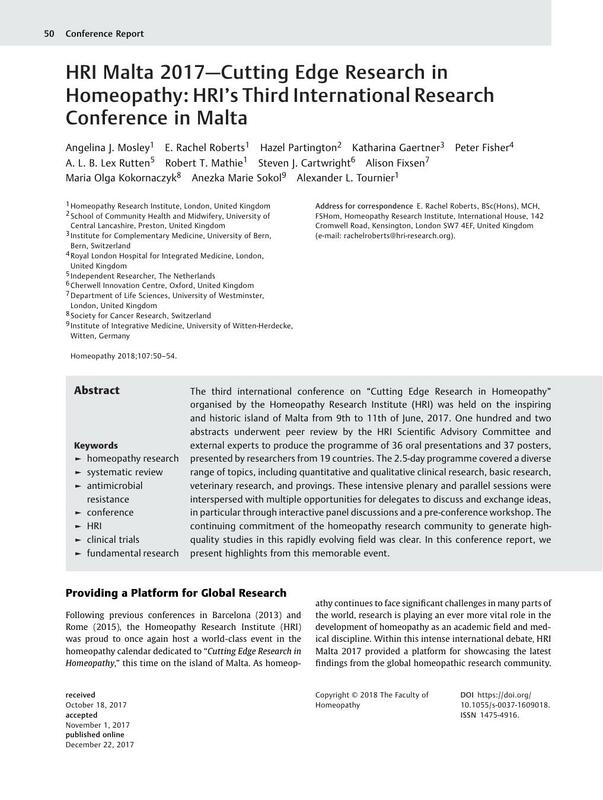 The third international conference on “Cutting Edge Research in Homeopathy” organised by the Homeopathy Research Institute (HRI) was held on the inspiring and historic island of Malta from 9th to 11th of June, 2017. One hundred and two abstracts underwent peer review by the HRI Scientific Advisory Committee and external experts to produce the programme of 36 oral presentations and 37 posters, presented by researchers from 19 countries. The 2.5-day programme covered a diverse range of topics, including quantitative and qualitative clinical research, basic research, veterinary research, and provings. These intensive plenary and parallel sessions were interspersed with multiple opportunities for delegates to discuss and exchange ideas, in particular through interactive panel discussions and a pre-conference workshop. The continuing commitment of the homeopathy research community to generate high-quality studies in this rapidly evolving field was clear. In this conference report, we present highlights from this memorable event.